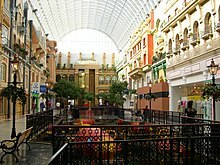 The West Edmonton Mall (WEM) is the largest shopping centre in North America. It is in Edmonton, Alberta, Canada. It is one of the main tourist attractions in Alberta. The mall is also the fourth largest in the world. WEM first opened on September 15, 1981. In addition to the over 500 shops in the West Edmonton Mall, there are many other things which people go to the mall for. Galaxyland: The worlds largest indoor Amusement park. The park has 24 rides. These rides include a triple loop rollercoaster. World Waterpark: world's largest indoor waterpark. The park includes the worlds largest indoor wavepool. The wavepool can create waves up to 5–6 feet in height. It also has ten water slides. Its tallest water slide is 83 feet high. Deep Sea Adventure: An indoor salt water lake with performing sea lions. The lake also has a structure built to look like Christopher Columbus' Santa María. The mall also has an Ice skating rink, miniature golf course, casino, skate park, hotel, petting zoo, three movie theaters and many other things to see. 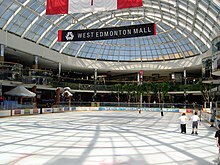 Wikimedia Commons has media related to West Edmonton Mall. This page was last changed on 6 August 2015, at 06:23.